Keith Kirk appeared in court Thursday with a face that looked like it had been trampled on by a horse. Kirk, 30, showed up in Fort Lauderdale bond court and stood before Judge John "Jay" Hurley with black swollen eyes and stitches between his eyebrows. It turns out that Kirk allegedly tried to steal someone's bicycle and ended up on the wrong side of the fists of justice. And while it looks like Kirk's pummeled face might have been the work of Batman, it was, in fact, the work of the bike's owner, Calvin McDougal. Kirk is accused of stealing McDougal's $600 bicycle outside the One Stop Food Mart at 18 NW First Ave. in Fort Lauderdale. We saved Kirk's mug shot for after the jump, in case you may not like looking at a dude's swolled-up face during lunchtime. According to the police report, Kirk took the bike and was then promptly chased down by McDougal. The two got into an altercation, and the robbery pretty much ended when Kirk ran into McDougal's fists a bunch of times. He was eventually transported to Broward Health Medical Center for medical clearance. Because his face looked like a half-cooked hamburger. Kirk explained his injuries to Hurley by saying he was tackled by McDougal. "I believe there was a little bit more than just a tackle," Hurley said. "Now, sir, you allegedly steal someone's bike and it looks like there was some street justice carried out." Kirk was charged with grand theft and released on his own recognizance. He was allowed to leave jail to get more medical treatment on his face. As he walked away from the podium, Kirk muttered, "Did you notice how the guy who owned the bike didn't get arrested?" 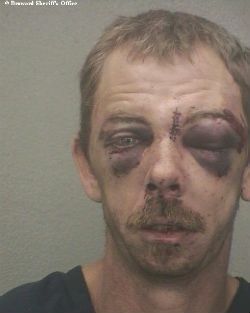 Of course, it's not a crime in Florida for victims to fight back and beat the BeJesus out of their muggers. Although cops insist that people should leave the crime-fighting to them. They might want to consider hiring this McDougal fella. I love when the victim emerges victorius! I have no sympathy for thieves, wonder if he tries to steal another bike anytime soon. The guy is a druggie by the looks of it. This type of thing can't happen often enough.